Free instructions for these very simple pillowcase dresses can be found at Nancy´s Notions Free Patterns for Charity where you can choose a project to sew for several different causes. There is a desperate need for shorts for boys. Make an item for someone you love and while you are at it make another one for a needy child in Africa. 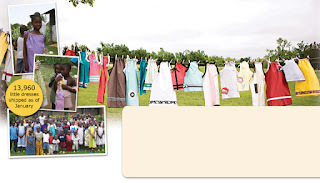 For more information about the charity visit Little Dresses for Africa. Or if not this, consider starting a similar charity to help needy children in your own area! Thank you for sharing this. I'll pass it on.